Plate 2 from the paper “An Account of Morne Garou, a Mountain in the Island of St. Vincent, with a Description of the Volcano on Its Summit. In a Letter from Mr. James Anderson, Surgeon, to Mr. Forsyth, His Majesty's Gardener at Kensington...”, Philosophical Transactions of the Royal Society, vol.75 (1785), pp.16-31. 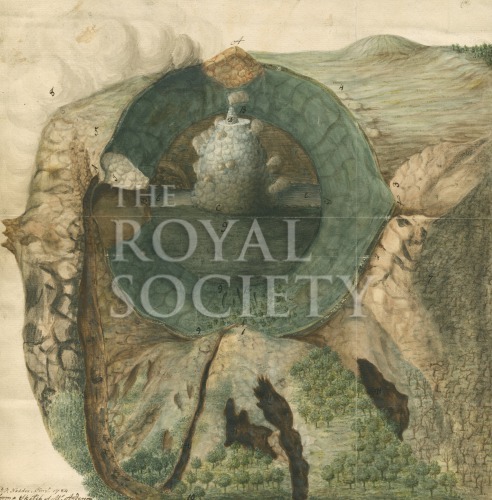 Schematic painting showing the circumference of the crater, two lakes of water within it and a central cone issuing smoke. Other details include the forested slopes of the mountain with some hurricane-destroyed trees.